We believe that the good news about Jesus is for everyone, everywhere. Telling others of God’s love and grace is central to our mission as a church, whether that be in our local community or further afield. To see this happen, we partner both with individuals we have sent and organisations, supporting them through friendship, prayer and financial giving. There are also groups from our congregation who give regular practical service to our Bristol based partners. These include Crisis Centre Ministries, Bristol International Student Centre, Easton Families Project, Changing Tunes and Bristol Soup Run. We believe that being involved in sharing the good news of the gospel and reaching out to those in need is an important part of how we learn and grow as Christians. That is why we aim to regularly share the experience of our partners through Skype conversations, email updates and prayer letters, and why each partner has a dedicated home group to keep in touch and pray for them. Whilst they are visiting Bristol, we enjoy learning from our partners, giving them the opportunity to speak at our services and share what God is doing in their work. We also encourage and support church members to travel and visit our partners where they work, which is a great way to build relationships, gain insight into the challenges of cross-cultural outreach and be encouraged by how God is transforming lives through it. We currently have partners working overseas in South Africa, Kenya, Tanzania, and Rwanda. In the UK we have partners working in Reading, Kent and Balham, London. Scroll down for more details of our partners. If you would like to know more, or to receive up to date news and prayer requests, please email info@redland.org.uk. Charles worshipped at Redland during his training at Trinity College Bristol. He is now one of our mission partners and principal of a small vocational and theological college in central Tanzania. Ruth and David both came to faith in Jesus in their teens. They met and married in London and then moved to Bristol and joined Redland Parish Church in 1974. In 2002 they joined OMF International, the mission agency which shares ‘the good news of Jesus Christ in all its fulness with East Asia’s peoples.’ They moved to the OMF centre in Singapore, where Ruth managed the mission’s guest home, and David worked as an architect on building projects throughout SE Asia. In 2012 David was appointed as OMF’s creation care advocate, and was tasked with exploring the growing ecological crisis, its impacts on the peoples of East Asia, and appropriate missional responses. David is also the East Asia regional coordinator for the Lausanne Movement’s global campaign for creation care and the gospel. Ruth and David returned to Bristol in 2014, but continue to work with OMF. Ruth coordinates prayer support and member care for missionaries; David continues his creation care work, and some building project consultancy. Our other OMF partner has served in a variety of contexts since 1985, and Redland has been one of their main supporting churches for over 30 years. They work in a sensitive region, please get in touch if you would like to know and pray more. Bridget went to the Democratic Republic of Congo as a missionary teacher while it was still called Zaire, but had to evacuate when fighting broke out in 1996. She came to Bristol to work at the Africa Inland Mission’s International Office and worshipped with us here at Redland. In 2005 the Lord made it possible to return to Congo and Bridget worked at the Institut Supérieur Pédagogique in Bunia. In 2011, Bridget moved to Rwanda, to the capital city, Kigali. She was asked to work at New Creation Ministries (NCM), partners with AIM International. Her task was to design and oversee the curriculum for preparing students to be ready to study theology at degree level in English. Rwanda is changing from being Francophone, to being English speaking, bringing the country in line with other East Africa trading nations. Bridget is now teaching at NCM. Anika, a native Australian, was for a time Redland’s Youth Minister. She missed the sunshine, but enjoyed the snow! Following this she went to work in Europe, with International Christian Youthworks, resourcing global youth evangelism and discipleship within the context of local church, and training emerging leaders to reach young people with the gospel. Following a move to Germany, she started to work for Fusion Europe, doing similar ministry under a different banner. She has since moved back to UK and is working for shift youth + community in Reading, partnering with local churches to reach young people in deprived communities. Arabella came to faith in Redland Church in the 80’s. She was working in Bristol as a midwife. Following her conversion, she felt called to serve God full time and has been with Faith Mission ever since. She works in villages in Kent, running bible clubs and after school clubs, doing school assemblies and helping on children’s camps. She works with local churches where they are willing to get involved. She has a deep desire to see children come to know Jesus for themselves. More recently, she has started teaching Bible Explorer in local schools. This involves systematic teaching of the bible, both old and new testaments and is a huge opportunity to introduce children to the Word of God. Dickson came to Bristol in 1999 with Pendo and their son Imani to do a PhD at Trinity College on “Reading the Book of Job with an African Eye”. They were part of the Redland family until their return to Tanzania in 2004, where their second son, John, was born shortly afterwards. Following their return to Africa, Dickson worked as Principal of Msalato Theological College near the Tanzanian capital Dodoma. For some years Dickson was been the General Secretary of the Anglican Church in the Province of Tanzania, a role that has involved extensive responsibilities and travel. He is now the bishop of central Tangyanika, the largest diocese in the Anglican community. 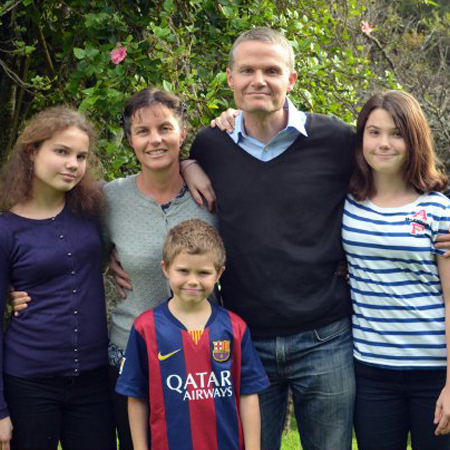 Sam grew up through the children’s and youth work at Redland, where his family have been members for many years. He did a degree in Youth Work with the Centre for Youth Ministry based at Bristol Baptist College, and did his placement at Redland. Following his graduation, Sam spent a year working on the church staff team before moving to London in 2010 to work at St Paul’s Old Ford in Bow: very different from leafy Redland. In September 2015 he started a new job as Youth Minister at a church in Balham. We are glad to continue to support him in prayer. Sam met Helen, also a youth worker, while working in London and they were married in 2012. They now live in Croydon. Helen works at Warlingham Methodist Church. Bruce and Jan worshipped at Redland between 1997 and 2000, before moving to live in South Bristol. At that time Bruce was working as a lawyer, but they felt increasingly called to serve in Africa, and Bruce eventually left his job and went to Trinity College to do an MA. They and their family went to Rwanda in 2006 under the auspices of the Africa Inland Mission (AIM), looking to settle long term in Africa, and Bruce taught at the Rwanda Institute of Evangelical Theology in Kigali. 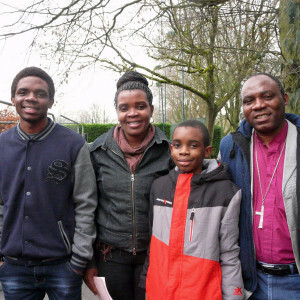 In 2011, Bruce and Jan returned to the UK and after a time of reflection, they went to Cameroon, on secondment from AIM to SIL (Wycliffe Bible Translators). For the following three years Bruce was involved in Bible translation while Jan home-schooled the children and was on the board of Rain Forest International School. They have now moved countries yet again to Kenya, where the children attend Rift Valley Academy, Jan is involved at the school and Bruce is continuing his work in Bible translation. They are once again under the umbrella of AIM. Please click here for Bruce & Jan’s latest news. Frank grew up in Soweto, on the outskirts of Johannesburg, and came with Maria and their four children to Bristol in the 1980’s to study at Trinity College. During that time they worshipped at Redland and established friendships within the church that have lasted for three decades. On their return to South Africa, Frank worked with Scripture Union and established an innovative youth centre in Alexandra, a large township to the east of Johannesburg. In 2000 he started to teach at the newly formed International College for Bible and Mission, which trains pastors and other church leaders, many of whom are on very low income. In 2003 he left SU to become Principal of ICBM. Frank retired as principal early in 2015, although he continues to teach at the college and to work with Langham Partnership in Southern Africa. He also pastors a church! Maria has also now retired from her teaching job. Their four children are grown up and scattered round the world.